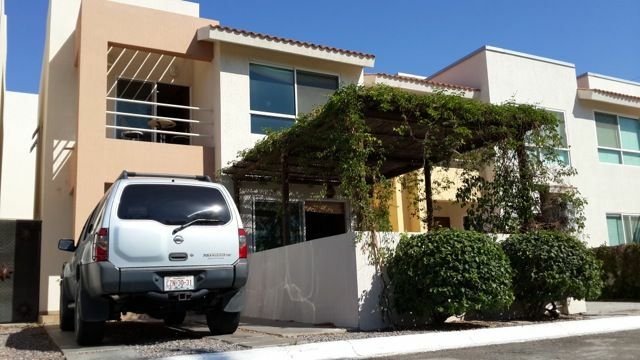 This lovely 1,550 SQ FT mexican house is located meters away from the sea. It's location makes it very atractive for tourist as it is walking distance from Downtown and world-famous malecon. La Paz is considered one of the safest cities in Mexico and the property is located in a family oriented gated community. The communal areas feature a heated pool, a palapa and a large BBQ area - or choose to use your private BBQ in the house backyard. The house is a two story property, kitchen with beautiful granite countertops, breakfast bar with stools, stainless steel appliances. The dining room features hand made furniture made from local carpenters in La Paz and seats 6 comfortably. Confortable living room with a 32 inch TV to watch your favorite shows in a pullout couch that sleeps two comfortably. The master bedroom has a king-size comfy bed, a walk-in closet and en suite bathroom. Second bedroom has twin beds for guests with plently of storage in their built in closets - private guest bathroom is directly across the hall from bedroom #2. NO SMOKING UNIT. Pets may be allowed with an extra security deposit. A large furnished pergola covered front patio extends the living space and is the perfect spot for morning coffee or late afternoon drinks. One parking stall available. The Complex has security guard at night and day-shift staff in case is needed. SUV is available for rent if needed. My wife and I are originally from New York, bought this place as a second home for vacational purposes. Proud owners of this lovely home since 2007 and we recently decided to rent it out to let other people enjoy our little piece of paradise in Baja. Enjoy! Spacious living area both inside and out, traditional Mexican colors and art work, family friendly yet beautifully appointed finishings, a short walk to the beautiful Malecon, restaurants and activities. Walking distance to Downtown. Restaurant, bars and grocery shopping walking distance. Tenants must comply with Bylaws & current rules for residents of the Complex. Any fines or penalties due to rules violations will be deducted from the security deposit.